Galvanized Steel and other metals (except gold) are inherently unstable. This instability is what drives the corrosion process. Metals are continually trying to revert to their natural state as an elemental mineral. Some metals corrode faster than others. As metal corrodes it expands. 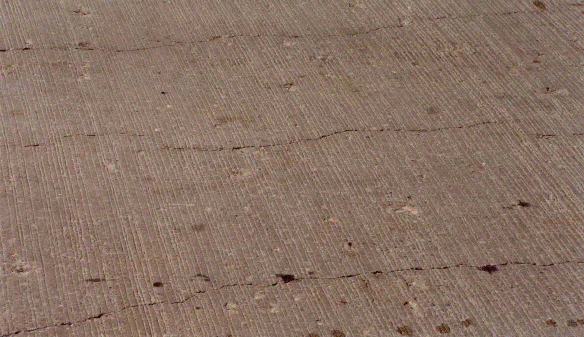 In concrete this causes degradation resulting in loose bonding, spalling, cracking and breakage. Hot dipped galvanized rebar relies on a sacrificial zinc coating to protect the underling black steel rebar from rusting. Although it has occasionally been credited with extending the life of concrete structures, it often has had little or even a negative impact on concrete life. Current government funded studies both in Canada and the U.S. indicate a life expectancy of 20 years with galvanized reinforced concrete. (Excerpts from current studies links are listed below). 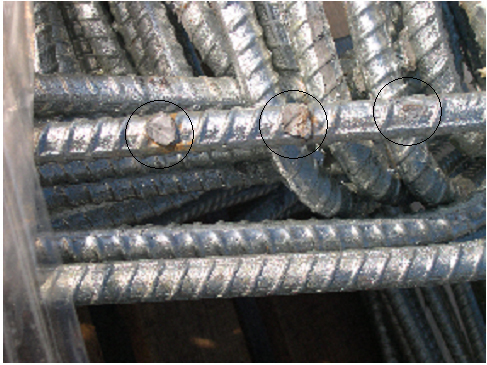 23-year-old Ontario bridge deck reinforced with Galvanized rebars suffering from corrosion induced cracking. This may be related to zinc’s high reactivity with alkali which is found in concrete. In certain applications, the by-products of the reaction will cause coating expansion rates of up to 260%. This effect may be as damaging to concrete as surface rust (see diagram below). All types of steel will eventually rust causing premature degradation of concrete structures. GFRP eliminates the corrosion cycle. Researchers believe that this is due to the differences in the modulus of elasticity between GFRP and steel. GFRP has a modulus very similar to concrete. Steel’s modulus is many times higher. Steel is less forgiving than GFRP. Damage occurs to concrete as steel bends within the pour. Corrosion protection on GFRP is integral. This eliminates problems related to zinc coating de-bonding experienced particularly on galvanized bends. It also eliminates premature degradation due to surface defects experienced with galvanized re-bar. Corrosion protection on GFRP is integral and consistent throughout the bar. Ends can be cut and do not require repair. The Long Term Performance of Three Ontario Bridges Constructed with Galvanized Reinforcement. Corrosion of the galvanized reinforcement caused significant damage to the concrete, in the form of delaminating and cracking. In the most severely damaged of the three structures, 10% of the surface area was delaminated, or had already been repaired, within 20 years of construction.Galvanized reinforcing bars are not recommended as the primary or sole means of corrosion protection for structures exposed in the Ontario highway environment. Based on the findings of this study, they do not provide effective long-term protection from corrosion. Concrete adjacent to the non-chromate treated bars evaluated in this study revealed no evidence of an increase in porosity due to hydrogen gas evolution during curing when compared to conventional reinforcement in similar air-entrained concrete. The galvanized bars, however, showed signs of corrosion, including exposure of the inter-metallic layer on some. The loss of the zinc layer may be due to the lack of chromate treatment or due to loss of metal in the presence of high-pH concrete pore solution; increased porosity relative to the concrete above the bar. As early as 1982, American Concrete Institute (ACI) Committee 345(5) stated; “At best, galvanized steel reinforcement is no better than non-galvanized reinforcement; further it is probably not as good as far as corrosion is concerned.”A “U.S. Department of Transportation Federal Highway Administration”(FHWA) memorandum quoted in (6) suggests a 15-year life for galvanized re-bar in good quality concrete. The 15 year FHWA conclusions were supported by Andrade et. al. (7) with respect to chloride attack. Researcher K. Clear (8) reported that galvanized rebar, when used in both mats in a bridge deck, will outperform black steel by only two years. McCrumb and Arnold (9) conclude that galvanized reinforcement will add five years to the service life of a bridge compared to black reinforcement. Zinc (Zn) is highly reactive with alkalis and will deteriorate to some degree upon contact with fresh concrete and/or mortar. The reaction is limited due to a corrosive film that forms on the outer layer of the zinc. It protects the underlying metal from further reaction. Zinc will not react with dry, seasoned concrete and/or mortar. Embedded zinc will react with moisture and calcium hydroxide to produce calcium zincate. Zinc corrosion may also occur when galvanized iron, in the form of flat or corrugated sheets and rebar, comes in contact with fresh concrete and/or mortar. Galvanized iron is coated with zinc and will react with moisture and chlorides in the concrete and/or mortar to produce zinc chloride. The result is expansion and cracking of the concrete and/or mortar. This report also present reviews the failure of the masonry facade at a bank in Cleveland, OH, where cracking of the mortar and brick occurs over galvanized re-bar. Analysis of the corrosion products of galvanized steel in such Cl­ containing mortar and concrete showed the Zn corrosion product under some conditions was zinc hydroxychloride II (Zn5 [OH]8Cl2·H2O). This product has been found by others, but its significance has not been recognized. X-ray diffraction analyses determined the unit cell of this corrosion product. The corrosion product occupied 260% more space than Zn and produced a much greater expansive. Performance of galvanized reinforcing bars in reinforced masonry and concrete has had mixed reviews. Substantially higher longevity has been found over regular mild steel rebar in some situations (1-3) but only slightly better (4), equal or worse performance (5-8) have been found in other exposures. Several investigators have reported such discrepancies and have suggested factors that might be involved. (9,10) Suggestions have included the degree of carbonation (and hence pH lowering), concrete cover, exposure variations, and the development of calcium hydroxyzincate. A review of the literature suggested differences might be related to chloride (Cl­) concentrations near the re-bar and such factors as exposure of the concrete to Cl­ salts, the porosity of the concrete or mortar (a function of the water/cement ratio), and the cover over the bar. However, most investigators failed to report all data needed to determine correlations between these factors. The present work reviewed the failure of the masonry facade at a bank in Cleveland, OH, where cracking of the mortar and brick occurred over galvanized re-bar. Black steel, as expected, had the highest corrosion rate in the presence of salt. However, its corrosion rate was less than the corrosion rate of both galvanized A and galvanized B. The reason may have been due to the fact that galvanized B was coated after it was bent, while galvanized A was bent after it was coated. Secondly, galvanized A rebar was bent by the supplier with a bent diameter. The Chair’s researchers have conducted field tests on more than 10 bridges across Canada… FRP materials can be preserved for 100 years or more. By contrast, steel-reinforced concrete will begin to deteriorate after 10 to 15 years and will generally require major repairs after 25 years. This study reviewed 5 Canadian bridges and 1 Canadian harbour that were constructed in the early 1990’s. All structures were exposed to harsh environmental conditions. Longevity of concrete reinforced with fiberglass rebar (GFRP) was extensively studied. The longevity conclusions from the studies contributed to the adoption of GFRP as an approved reinforcement for Canadian and American Civil Structures.